This needle features a cutting point. 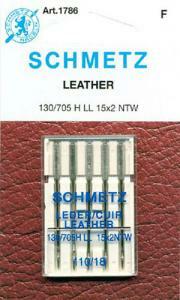 Use on leather, artificial leather, heavy non-woven synthetics. Do not use on knit or woven fabrics. Can damage fibers. Available in sizes 70/10-110/18.